My name is Jim Scarpine; I am the TMP mentor for this project as well as a Tripoli TAP. I started flying rockets when I was a teen. I left the hobby for a few years and joined Tripoli in 1989. I have been continuously flying for 24 years now. I fly at multiple clubs including Orangeburg, Charlotte, Battle Park, Thunderstruck, and Midwest Power. I am also the founder of Tripoli North Carolina and Whitakers. I will be mentoring this group through the design and building of the rocket. I fully support the project and have multiple other adults backing me in this huge undertaking. All of the members have demonstrated to me that they have the necessary skills to build a rocket of this size. My name is Matt Fletcher. I am a 16 year old rocketry enthusiast from Apex, NC, and launch with Tripoli East NC in Bayboro, NC and ROSCO/ICBM in Orangeburg, SC. I have now been launching rockets for about 4 years now. I have launched everything from small A motors to an I357, and will soon be launching an EX J motor made by somebody in my club. I have always loved big rockets. The challenge of building the rocket to be able to survive the thrust of a massive motor while keeping the rocket light enough to launch, the months of simulating and planning that go into a rocket before the first tube is even cut, and the sheer thrill of watching the rocket finally launch all are part of the reason that I am involved in this build. During this build, I will be working on the electronics bay. My name is Connor McGrath. 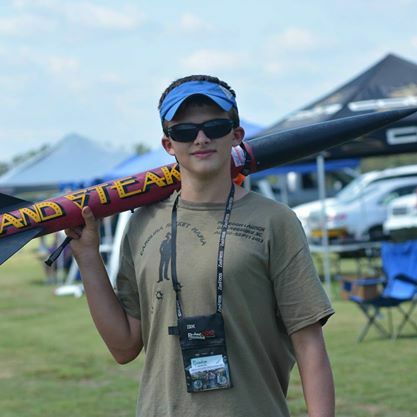 I am 16 years old and have been involved in rocketry for 7 years. I have launched High Power rockets for 3 years now and I obtained My NAR JR. L1 almost a year ago. I am also Tripoli TMP. I flight with CTRA-NARCONN in Cobleskill NY. I’ve launched dozens of L1 range motors from Small H’s to Large I’s. The reason I am involved in this project is that I like complicated rockets. Anything from high performance minimum diameter rockets to 2 stage rockets. Any build that makes me think about what I do and need to think my way through something is a project for me. The main difficulty to this project is figuring out what materials we need to use and how to build it such that it will fly safely. Another challenge we face is having this build approved by the community, we will be told we can’t successfully build something of this scale so we will need to show everybody that we know what we are doing and that we can build/fly something this large sucessfully. I will be looking over a lot of things throughout the build, from the laminating of the airframes to how everything goes together. I will also be in charge of painting the rocket. My name is Cody Smith. I am 15 years old and have been involved in rocketry for 8 years. I got my NAR Jr. L1 in April of 2014. I generally fly with MMMSC in Berwick Maine. I am also TMP with Tripoli. The reason I am involved in this project is because I enjoy building large, heavy rockets of large diameters. I am currently working on multiple other complicated builds that are helping me gain experience for the complexity of this rocket. We face many challenges in our build that we need to overcome such as figuring out a way to make our AV-bay removable while still having the strength needed for such a heavy rocket. These issues are all being addressed in our group chats and approved by our mentor. Jim is guiding us with any questions we have in regards to this rocket. As with Connor, I agree that showing the rocketry community that we can do this project is important as it appears that we don’t have total support. For the project, I will be in charge of building the motor mount as well as helping out with fiberglassing the airframes, installing motor mount, and fins. My name is David Nagy, I am from Hanover, New Hampshire and fly with Maine Missile Math and Science Club. I am yet to be JR. L1 certified. I joined this project because I have always been drawn to large rockets. I’m interested in them due to the engineering challenges such as keeping weight down but retaining structural integrity and finding a motor with the perfect ratio of thrust to weight. I instantly accepted my teammates’ invitation to join. I am working on glassing the airframe, attaching fins and a few other things.